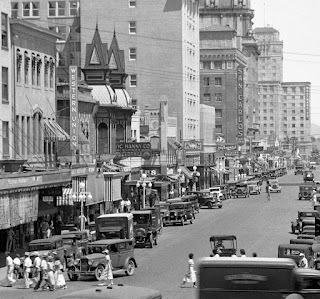 Let's time-travel back to Phoenix in the 1930s. In fact, I'd like us to go back to 1934, when Bonnie and Clyde were out on their spree of bank robbing and murdering. It would have been a subject that everyone was talking about, and reading about in the newspaper. No, Bonnie and Clyde never came close to Phoenix. They would have liked it, as Phoenix has always been a city of banks. And the only reason that I'm thinking about them today is that I'm watching a movie on Netflix about them, set in 1934. And you know me, I'm looking at the cars, and the buildings, and what people wore, and what their world would have felt like then. In 1934 Prohibition had just been repealed the year before. That is, things like beer, wine, and spirits were no longer illegal in the United States. The 1920s had given people in the U.S. a taste for rebelling against the system, and flouting laws that most people considered unfair. And then things got really, really, bad in 1929, when the economy crashed. It was called "the Great Depression" and so many people were out of work that people were desperate. And as people lost their jobs, they lost their houses, and farms, repossessed by banks. So, if the photo at the top of this post were taken when Bonnie and Clyde were out there (I know that it's the thirties, but I'm not sure exactly what year), people would have known a lot of foreclosures, friends and family losing houses and farms, and being forced out by the banks, and the Sheriff. These people weren't criminals, they were simply unable to pay the mortgage, or rent. And as you'd expect, there was a lot of resentment for banks, and for law enforcement. If you've ever wondered why so many people back then were actually cheering for Bonnie and Clyde, that's why. Bonnie and Clyde were cold-blooded killers, and nowadays it's hard to imagine why they would be so favored in popular culture back then, but they were. Now hang on, I'm not trying to paint an unpleasant picture here, I'm just stepping back in time. Whenever I see cars from the 1930s, or those typical dresses and shoes that women wore back then, I think of Bonnie and Clyde. And that makes me think of many other things, good and bad. Thank you for time-traveling with me! Image at the top of this post: Looking north on Central towards Adams in the 1930s, Phoenix, Arizona.